Tis the season for family, friends, great food and excellent wine. It’s been a busy year, a busy few years in fact and we have several hot topics to cover including rising values in wine country, this years short crop (double edged sword), sustainability (in the vineyard and your wallet), and last but certainly not least el nino. Like staring at a pile of presents under the Christmas Tree, let’s get started! Despite challenges, wine country values keep going up! Wildfires and drought have not been able to contain the positive momentum. 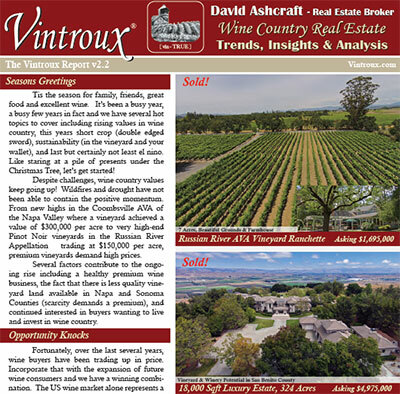 From new highs in the Coombsville AVA of the Napa Valley where a vineyard achieved a value of $300,000 per acre to very high-end Pinot Noir vineyards in the Russian River Appellation trading at $150,000 per acre, premium vineyards demand high prices. Several factors contribute to the ongoing rise including a healthy premium wine business, the fact that there is less quality vineyard land available in Napa and Sonoma Counties (scarcity demands a premium), and continued interested in buyers wanting to live and invest in wine country. Fortunately, over the last several years, wine buyers have been trading up in price. Incorporate that with the expansion of future wine consumers and we have a winning combination. The US wine market alone represents a major opportunity to expand as consumers, specifically Gen Y and Millennials, become more interested in learning about and drinking wine. These two groups alone represent more than 100 million new potential customers. In other words, there is still a lot of room to grow. While there haven’t been a great deal of new vineyards planted, replanting of old vineyards has taken precedent. This makes developed vineyard land all that more special. Here is a quick look at planted vineyard acres in Napa and Sonoma Counties. In Sonoma County there are 59,974 acres planted to vineyard (roughly 6% of total land) of which 15,693 acres are planted to Chardonnay. In Napa County there are 49,915 acres planted with 19,894 acres planted to Cabernet Sauvignon. For comparison, statewide there are 97,826 acres planted to Chardonnay and 87, 972 acres planted to Cabernet Sauvignon. Short jokes can amuse and offend. Looking back at 2015, the early season warmth and bud break ran into a cooler than usual May ultimately causing our short crop. It could be said that last Spring had a wicked sense of humor. With many growers reporting yields 25 – 50% less than the previous year, the results are no laughing matter. Even so, after several large back-to-back harvests, we can take solace that the 2015 harvest is high quality and the low yields will help keep wine grape prices strong going forward. This should keep growers smiling into 2016. The word sustainable is something that has yet to be completely defined in the vineyard world. However, it is generally used to represent responsible techniques in farming practices. As more consumers become eco-conscious, it is important for us to communicate our good stewardship of the land and sustainable farming practices. In Sonoma County more than half of all vineyard acres have completed a sustainable assessment with the goal of becoming the first 100% sustainable wine region in the United States by 2019. The parameters for sustainability in this sense are defined by the California Sustainable Winegrowing Alliance: “winegrowing and winemaking practices that are sensitive to the environment (Environmentally Sound), responsive to the needs and interests of society-at large (Socially Equitable), and are economically feasible to implement and maintain (Economically Feasible). Learn more at (sustainablewinegrowing. org). Numerous growers in both Napa and Sonoma Counties have been farming with sustainable practices for many years. With this initiative we can communicate our values to consumers and visitors alike, as well as set a precedent for future generations. Another point on sustainability, make sure you have a sustainable relationship with your grape buyer. With that in mind let’s take a quick look at high points in many grape purchase agreements. Per a recent article from Allied Grape Growers it is estimated that nearly 95% of California wine grape sales are contracted using agreements created for wineries and drafted by attorneys. Price Determination: Note whether there is a fixed price or negotiated price. Many contracts point to a district average and can be adjusted by adding or a decreasing price by a percentage. Viticultural Practices: Include a farm plan within the contract. This is more common with high end wine grapes, examples including shoot thinning and leaf pulling etc..
You can’t go far without hearing about the impending el nino. In order not to jinx anything, I will leave you with a couple thoughts. If you haven’t done so already, clean your gutters! More importantly enjoy your family and friends, and spread good cheer throughout the holidays and into the New Year.